DO YOU NEED ROAD SIDE CAR BREAKDOWN ASSISTANCE? DO YOU NEED A CAR TOW TRUCK? We offer you the full car broken down tow & recovery service. We can also repair your car if broken down. Refer to our other web pages to find the type of breakdown car service or repair you require. Just click on the index button down the left hand side. Geddes Automotive Ltd is a family business. We have been in business repairing cars, vans and trucks for approximately 46 years and in Onehunga for approximately 33 years. If your car has broken down (or van) because of a mechanical failure — engine — wheel bearing — brakes, it´s overheating, has an auto electrical breakdown problem, a computer problem — has a check engine light on, your car won´t start problems, a bad battery, then call us we can help you. We also do car & van servicing. DOES MY CAR INSURANCE COVER TOWING OF MY BROKEN DOWN VEHICLE? If you have a cars breakdown insurance with: AA INSURANCE, AUTOSURE INSURANCE, IAG INSURANCE, DRIVERIGHT INSURANCE, LUMLEY INSURANCE, PROTECTA INSURANCE, Geddes have repaired vehicles for all these insurance companies. They should reimburse us for the cost of a breakdown car recovery tow of your vehicle so the breakdown recovery tow should be FREE to you. We need to check your insurance policy wording. Brakes Failed or Locked On. Dash Warning Lights Are On or Not On. Smell burning Fan belt – Auxiliary belt. Low battery voltage can cause electrical items to overheat and fail. If you keep trying to start the engine you can damage your computers and starter motor. It is better to get a jump start so long as they connect the jump cables correctly. Put your hand on the centre of each wheel carefully so you do not get a burnt hand. Each wheel should be a similar temperature. If one wheel is hotter than the opposite then you may have a seized brake piston which is not releasing that brake. If you have tools available you could undo the brake line from that wheel brake to release pressure and the wheel should free up. Next time you apply the brakes it will lock up again. You can drive using the hand brake and only the foot brake in emergencies. This is EXTREMELY DANGEROUS and should only be attempted in emergencies and if you are confident. The better way is to call for our car breakdown recovery tow truck. If the cambelt slips a tooth the engine may continue to run but with a loss of power. BUT major damage can occur to some engines, you can bend valves and damage the bore and pistons if it jumps another tooth. If the cambelt breaks the engine will not run. To avoid costly damage ring us for a car breakdown & recovery tow truck to collect your van or car. If the clutch is slipping or lost all drive then you will need a car breakdown services tow truck. If the hydraulics or linkages have failed or broken you may be able to push start it in gear. If you can judge the engine revs correctly you may be able to change gear but to stop you may need to switch the engine off. A skilled driver could get home this way but we do not recommend it. It would be best to use our car breakdown service — tow truck. When a CV Joint gets to the end of its useful life you will notice a clicking sound when turning. If you continue to drive it the joint will also click when going straight ahead. If you continue to drive it the joint will eventually collapse and major damage can occur causing your car breakdown. You can smash the hub and housing. You can smash the side out of the gearbox or transmission or diff. Difficulty in steering may occur. It is far cheaper to call for a car recovery and breakdown tow truck compared to the cost of repairing the extra damage. If no lights come on then could be a failed battery, battery leads or blown main fuse. If the engine Check Light comes on there could be many reasons: fluid levels low or a bad sensor. Check your engine oil and coolant levels. If the levels are OK then you may be able to drive to a garage that has a scanner to check why the light is on. If the alternator light is on usually means a fault in the charging system. An alternator belt may have broken. If it has and you do not clear it away major damage can occur. You may be able to continue driving with caution. But a car breakdown recovery companies tow truck is the safest way home. SRS lights means there is a fault in the airbag or seatbelt systems. This means you may not be protected in the event of an accident and your insurance may be voided as your vehicle will not be in a condition to pass a WOF, but the car can be driven with caution. You won´t need a tow car. You may be able to drive somewhere to get help. If you are desperate you may need to smash a window using a solid object. You may be able to drop or remove the rear seat to get to tools in the boot. You could try lying on your back and kicking a window out. The rear window could be the easiest. If you have an electrical breakdown, switch off the ignition. Check the battery terminals are tight. Check the fuses. If there is a bad smell then there could be an electrical short. If you see smoke then switch off and get clear and call for help — probably 111. The car could burst into flames. Keep the windows, doors and bonnet closed to help prevent oxygen feeding the fire but your safety comes first. In the case of an auto electrical breakdown call Geddes 09 636 7064. If the belt is squealing you need to get it checked and adjusted. The rubber is probably old and hardened. The belt should be checked at each service (at least annually) and replaced if in poor condition. If the belt breaks or comes off damage can occur. A belt that is slipping is not giving full drive to parts like your: alternator, water pump, power steering, air conditioner. If it comes off or breaks these parts will cease to work. If your auxiliary belt drives your water pump you need the water pump working to proceed in a limited and cautious way. You may be able to tie a woman´s stocking to get some drive around the pulleys. Call for a breakdown services car tow truck. If you have a broken down car or van and your petrol or fuel gauge shows it has fuel in it then you may have a clogged or broken car fuel filter or your fuel pump has stopped working. With modern cars when you turn the ignition key on the computer cycles the fuel pump a few seconds each time. You could try turning the key on & off a few times for 5 second to see if you can hear if your pump is working (most pumps you can hear whir). This may get the engine to fire. You could try removing the fuel filter and clean it out enough to get you home. If there is a wiring, computer, pump problem then it is doubtful you can do a temporary roadside repair. You will need a breakdown tow truck. So long as it is just a slight misfire you may not need a tow truck and be able to limp home. Check your coolant and engine oil levels regularly you could possible limp home paying attention to the temperature and oil pressure. A breakdown car recovery tow and some repairs is nearly always far cheaper than continuing to use the vehicle and doing more damage. If you continue to drive the vehicle you may need to replace the engine instead of just repairing the existing engine. If you are always in the habit of checking your temperature gauge every time you change gear, then you should have noticed the temperature going up, you may have smelt the overheating engine. If you have turned off your engine in time you may not have damaged the engine. If you haven ´t already then pull off the road and switch the engine off. Temperature gauges don ´t always read the correct temperature of the engine. For instance if you have not noticed the temperature rising you may have lost considerable quantities of coolant. If the temperature sender is not surrounded with coolant then it may not be sensing the correct temperature and it may appear that the engine temperature is OK when it ´s not. Be extremely careful opening the bonnet — steam can billow out causing bad burns, turn your head away from the engine and open the bonnet very slowly. Let the engine cool down until you can put your hand on the radiator cap. Once you can stand the heat left in the radiator you may be ready to open the cap. Make sure you place a rag over the cap, turn your head away from the cap and turn it a few millimetres at a time. The idea is to release the pressure (if any pressure is still present) without the cap blowing off and squirting boiling water over you — BE CAREFUL). Once the pressure has been released and the cap is off you can now add water. Adding water to a hot engine can cause major damage — it´s like leaving a frying pan on a hot element then adding water. The water can explode, the sudden change in temperature can cause metal to crack. If this happens then the engine can be repaired but the costs are usually very high. Trickle the water in with the engine running, if you don´t have water then drinks will help to get you mobile to get where you can get water. Once you get to a garage you can have the coolant system checked out — pressure tested or what ever it may require. The coolant can be drained and a mix of antifreeze and water can be added. 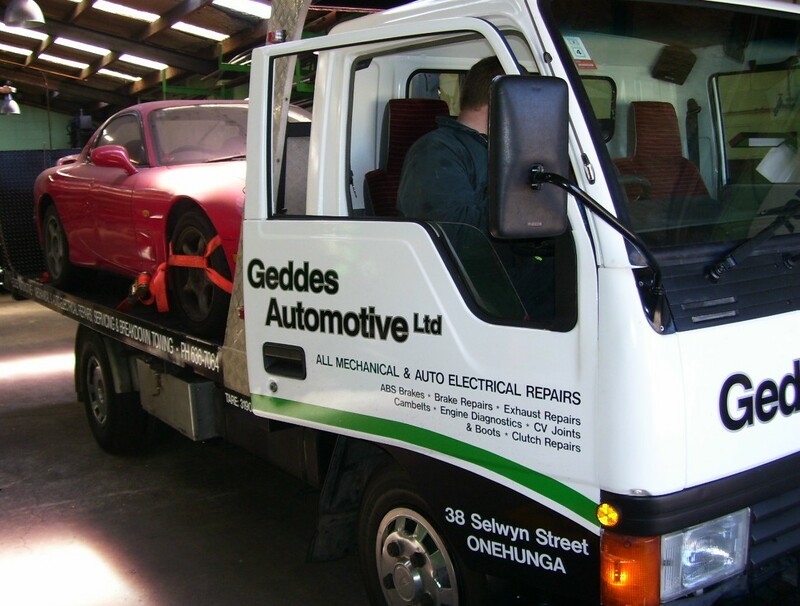 Geddes provide car breakdown & recovery services of broken down vehicles, we also have the equipment and the knowledge to repair vehicles of all make, models, and years. We also fix broken down vans & trucks. The more modern vehicle MUST be serviced regularly. See our servicing page for more advice. We recommend the least you should do is to change the oil & engine oil filter at intervals less than 10,000 kms. Dirty oil rotating through the engine will wear the engine parts prematurely and eventually the oil galleries will close off and starve parts from being lubricated. If the engine develops a knock or noise, then having it towed is cheap compared to a difference of: that engine being easily repaired, being a full replacement, or rebuild. If you have a flat tyre and need to move the car because it is a matter of life or death then you can move it a short distance on a flat tyre. If you continue driving on a flat tyre you will destroy the tyre, then the rim and probably the brake lines mudguards and more. If you have an inflated spare wheel, jack and wheel brace then you can change the wheel. It´s always best to learn how to do this on good solid ground, tar seal or concrete driveway and at home before you begin driving. Move the vehicle to the flattest most solid ground you can find. Clean away loose rubbish stone etc from the area where you are going to place the jack. Loosen the nuts by half a turn on that wheel before you jack the vehicle. Jack the vehicle 25mm off the ground. Test how solid the jack is holding the vehicle. Without putting any part of your body in harms war (under the vehicle) shake the vehicle. If you are happy with the security of the vehicle proceed and remove all wheel nuts then the wheel. Fit the spare wheel, do the nuts up tight, lower the vehicle then check the nuts again. You should be able to put at least 80 kg of weight onto the wheel brace. We specialise in car breakdown recovery services. If you are at all concerned whether you should continue to drive your car or van, call us for free advice. vehicle for engine & exhaust repairs.